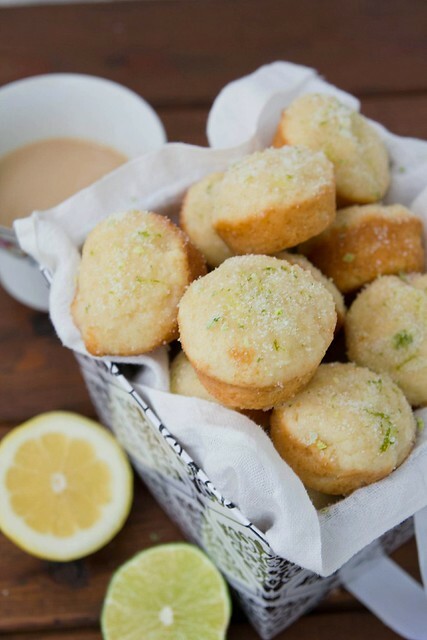 Today, I’m excited to have Suzanne from Kokocooks on Katie’s Cucina today sharing these delectable muffins! Suzanne and I met through a local message board while planning our weddings 5 years ago. We then were reunited two years later once we both started our food blogs, and since have become friends in real life. Last year, we went to Epcot’s Food and Wine Fest together as well as Food Blog Forum Orlando. I love having food blog friends in real life. So without further ado… here is Suzanne! Hello, I’m Suzanne of Kokocooks. I am a home cook who lives in Orlando. I’m also a full time teacher and a part time musician. Every Friday I post a photo from one of the fabulous food trucks that rumble around town. I’ve been blogging for almost three years now, and still feel very much like a beginner. I’m about to move to a self-hosted site, which scares the socks off me. But it’s definitely time to take that step, and Katie has been a huge help in encouraging and guiding me through the process. 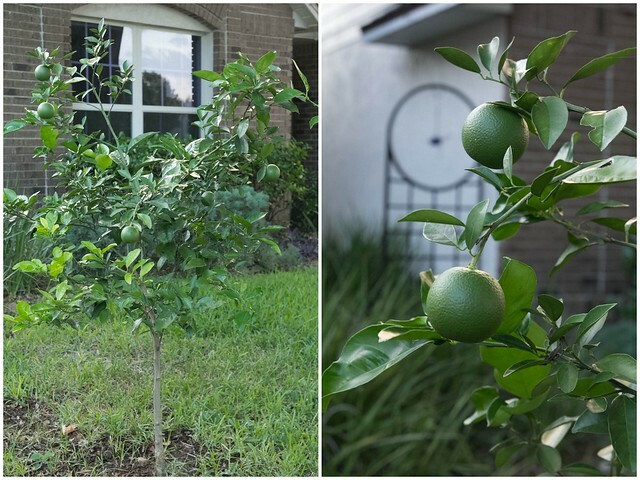 A few years ago, we planted a lime tree in our front yard. The first year, it had a ton of blossoms but no limes. This past year, we had a ton of blossoms which resulted in 5 limes. Progress! Our home grown limes tasted so much better than the store bought ones. I couldn’t get over the intense color of the pulp. I can’t wait until next year; hopefully we’ll have an even bigger crop. 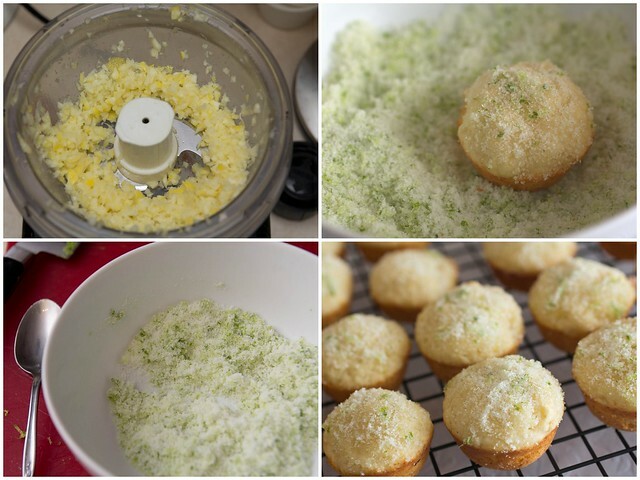 One of my favorite ways to use lime is in these muffins. 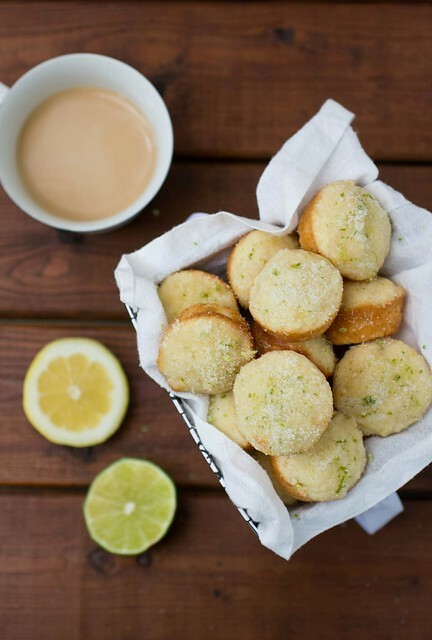 The zest becomes a part of the fragrant lime sugar. I love sticking my face over the bowl and inhaling the sweet citrus scent. Their compact size are perfect for sharing. I made them last year for hungry orchestra musicians, and I’ll most likely make them again when the orchestra begins their concerts for the elementary schools in a few weeks. Preheat oven to 350⁰F. Coat mini-muffin pan (24-cup or two 12-cup) with nonstick spray. Whisk flour, baking powder, baking soda, salt, and nutmeg in a bowl. In a separate bowl, combine yogurt, minced lemon, milk, and vanilla. In another bowl, cream butter and sugar until light and fluffy. Add egg and beat well. Add half of flour mixture; beat until just combined. Add yogurt mixture; beat until just combined. Add remaining flour mixture and beat until combined (don’t worry if there are a few lumps.) Fill cups of prepared muffin pan to about ¾ full. Bake until a toothpick inserted in the center of a muffin comes clean, about 15-16 minutes. Cool for 5 minutes on a wire rack. Turn muffins out onto the wire rack. note: to make minced lemon, cut the fruit (rind and all) into pieces. Remove seeds, and pulse in a food processor until chopped to bits (see picture in collage). It took about half a lemon to equal the 2 tsp needed for the recipe. I hope you enjoy the muffins! You can follow me on Twitter, Facebook, Instagram, Pinterest, and Google+.